The magic that is step 17 has now been completed! It started out as an old school Nintendo step, to a video game step, to a good ole find crap at garage sales and sell it kind of step. It started last February, so this step took me 5 months to complete. Like most of the steps the starting and finishing strategies were a bit different. At first I compiled a list of popular selling Nintendo games and found an average selling price on eBay. Then I went through eBay and started purchasing games that were lower than that price. This method was pretty solid, but was quite time consuming. At the rate I was selling the games on eBay I was really only making around $2 per game. I was going to have to sell a shload of games to get to my goal. The toughest part was that the first set of games I purchased never showed up and I am still fighting with PayPal, eBay and the seller to get my money back. At the outset of this step I was already down $100. If I ever get it back it will be like found money (I really shouldn’t have mentioned this because I bet my wife will expect something pretty if it ever shows up). Seeing as how selling the games was not that profitable on eBay I decided to start moving the games on Used Victoria. I could get a better price for the games, but things moved a lot slower. The benefit of eBay is that you have a global market, while Used Victoria is local and filled with unreliable people. I ended up with a ton of games and nothing was moving. It was then that I decided to have a garage sale. This garage sale also doubled as my birthday party. My wife asked what I wanted to do for my birthday and I actually asked for a garage sale. The garage sale moved most of the games, and put a bit more money in my pocket. The point where this entire step really turned around was when my son and I started getting the “garage sale hypes.” Each Saturday we would get up early, eat our breakfast really fast and then run out the door looking for treasure. On one particular day we found the “dream garage sale” (and I have garage sale dreams all the time, just ask my wife). My son and I walked up to the garage sale and we saw a bunch of old gameboy games on the $1 table. These were pretty popular games. I started totaling their value in my head as I picked them all up. There were 13 in total that value around $100. I was pretty stoked. The people at the garage sale saw my excitement; we all saw dollar signs. 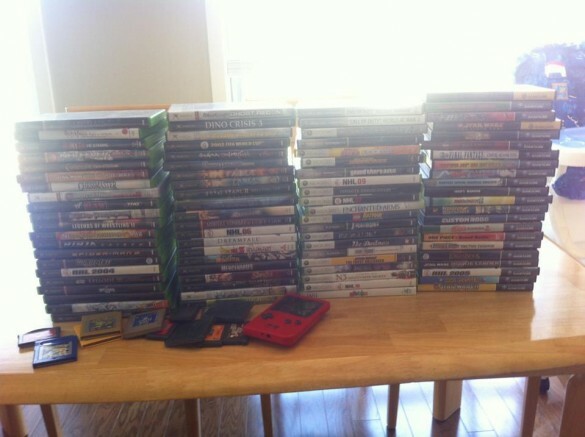 That day I calculated the retail value of all the games. It was around $600. In the end I sold them all for around $400 dollars. During the entire journey, my son became very excited about going to garage sales. Every single Saturday he came home with something free. He totally worked his ‘cute little boy charms’ to get free stuff. I’d like to think that people gave me better deals because he is so cute. Near the end of this step I really got a hand on how to be successful at selling video games. In fact I think I will continue selling games in the next step and combine it with something that I have been cooking up via Etsy. Stay tuned, and hopefully this next step will be completed faster than the last few steps. Chris, I am so proud of you. Modifying plans is part of success. You and Christian get to bond and daddy is teaching him valuable life lessons. I am glad that this is fun for you and I look forward to seeing how your next step goes and is achieved! Scrooge McDuck pool, here it comes! I think the boy totally got you good deals, he is totes adorbes. Sounds like step 17 also involved the start of a father & son tradition. I can’t wait to see what you sell on Etsy!